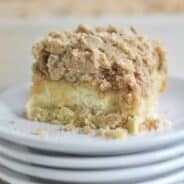 Overnight French Toast Casserole. This delicious breakfast need to be on your menu ASAP!! You won’t regret it! For some reason, this seems to be one of our busiest years ever. From the time we moved back to Illinois in July until today (oh my gosh, we’ve been here 5 months!) I feel like we are doggie paddling. You know, barely staying above the surface. With two in high school, one junior high and one in middle school, our evenings are booked. And by the time Saturday rolls around, all we want to do is lay in bed and sleep in. Unfortunately, those of you with swimmers will understand, that never happens. I don’t know what a lazy Saturday morning, reading the comics is anymore. Sounds wonderful. 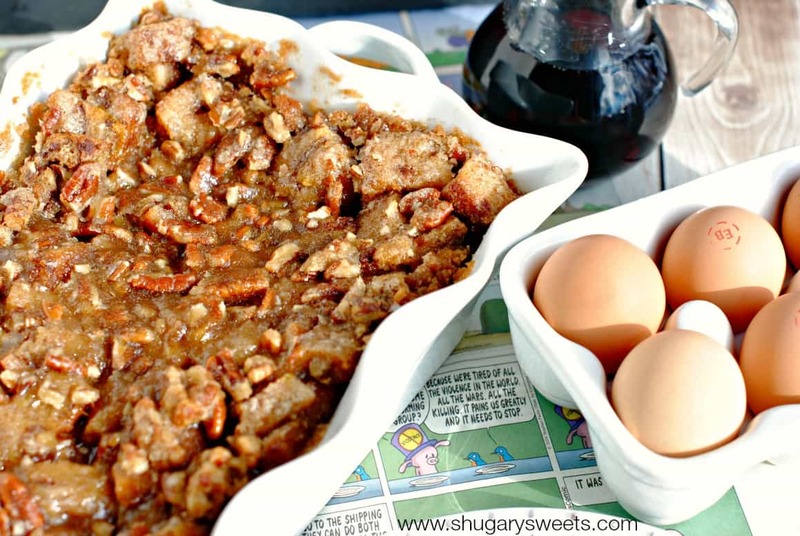 And I bet this French Toast Casserole would be awesome on that make believe lazy morning too! In our house, since we don’t get many lazy days, we do breakfast for dinner. Often. And french toast makes an appearance 9/10 times because we all LOVE it. How easy would it be to make one of these casseroles instead? Make it the night before, or the morning of, or even right before. This casserole is totally flexible like that. And yet, it tastes amazing no matter how long you let it sit. The best part? It’s filled with nutritious, high protein eggs! Did you know one egg has 13 essential vitamins and minerals in varying amounts, high-quality protein, unsaturated fats and antioxidants, all for 70 calories. Additionally, more eggs are consumed during the winter holiday season than any other time of the year, including Easter. I had no idea! There’s a good chance those eggs could be from Ohio egg farms! Ohio is the second-largest egg producing state in the nation. I was fortunate enough to go visit an egg farm earlier this year! You may remember when I shared this recipes for Greek Omelettes (I also shared my highlights of my trip). I got up close and personal with the chickens and the eggs! Thank you to the Ohio Egg Farmers for providing eggs to the country! Place bread in a 2 qt baking dish. Set aside. In a large bowl, whisk together the eggs, milk, cinnamon, vanilla, cloves, nutmeg, and salt. Pour over cubed bread. In a small saucepan, melt butter. Whisk in brown sugar and heat over low until melted. Remove from heat. Add in chopped pecans. Pour over bread. For more EGG-cellent recipes, be sure to check out my friends who are participating too! 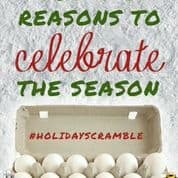 Be sure to join me and my fellow bloggers, along with the Ohio Poultry Association for a Holiday Scramble Twitter Party! Wednesday December 10 from 9-10 pm EST. Use the hashtag #holidayscramble to join in the fun!! Be sure to RSVP to the party here: http://tweetvite.com/event/HolidayScramble. Simmers hours are brutal! I don’t envy you, but I know what you about being too busy! This is why we do breakfast for dinner too! This will be added to the rotation, looks so good! Don’t you sometimes wonder what you did with all of your time before you had kids? Crazy how busy life is, wouldn’t trade it for anything, but the occasional lazy Saturday morning would be nice. Especially if I had this breakfast waiting for me! I hope things will calm down and you will have a chance to relax soon. 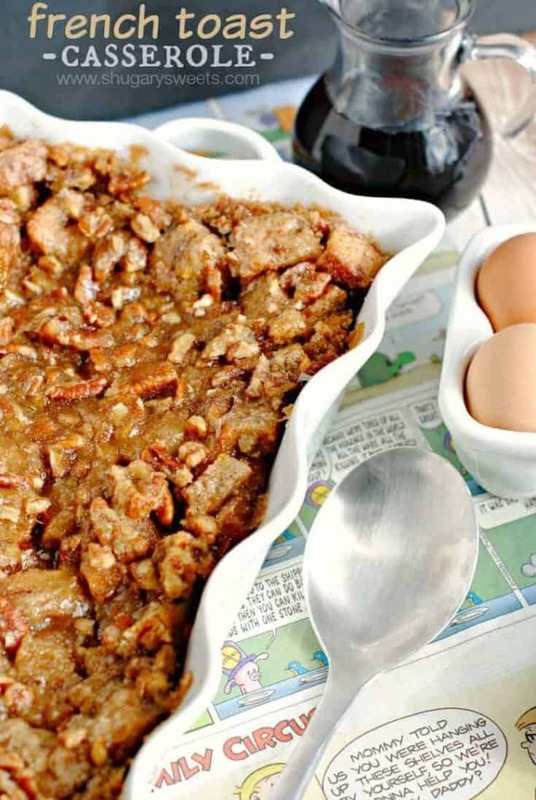 We adore French toast so this casserole sounds perfect! Love that it’s an overnight dish! 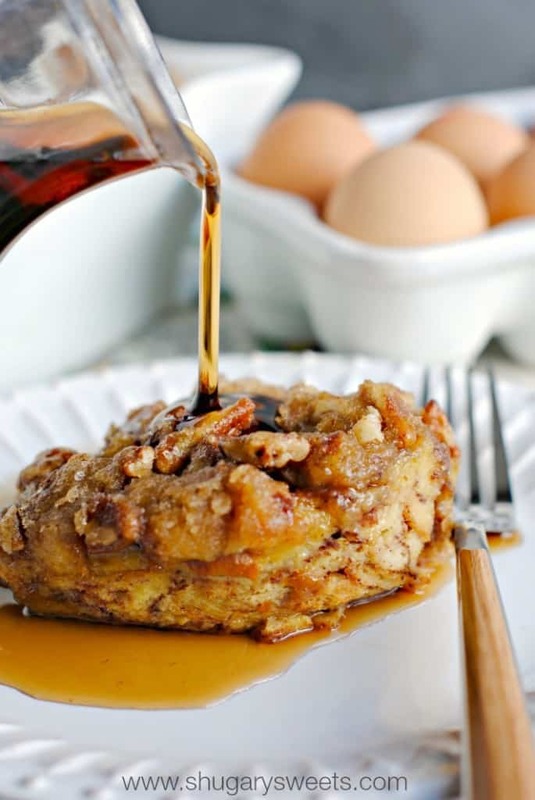 This french toast casserole looks utterly delicious! Great photos. Thank you so much for sharing this recipe. Oh I definitely need this in my life. We eat SO MANY EGGS and there are just 2 of us, so I can’t even imagine how many you guys go through! Overnight French toast is one of my favorite recipes. It’s like waking up in a bed and breakfast! Umm this looks like the most amazing french toast in the history of french toast!!! Totally want to make this for Christmas morning!!! You can’t go wrong with Breakfast for supper any day of the week! Love this french toast! French toast is one of my favorite things to have for a special breakfast! I love your overnight version, such a time saver! I should make this casserole for my children. They will love it! My recipe tomorrow is a French Toast Casserole 🙂 How fitting! I swear, always! Yours looks gorgeous, pinned, and I want it for breakfast! ALWAYS 🙂 I already pinned your french toast this morning, Yummers!!! French toast is my four year old’s favorite food, hands down. The second is waffles. Can’t wait to give your casserole a try as I know she’ll give it rave reviews! 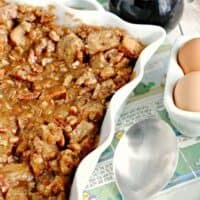 I have yet to try an overnight type casserole! This would be perfect for Christmas morning! I love lazy morning breakfasts 🙂 I also love the comics in the photos…such a cute idea! I feel for you. My kids were in sports too so we were always on the run, no sleep in days at all. It was a crazy time. But so much fun. I look back now and wish I was still running around with both of them. I hate that my son is away at school. Every single day without him is weird, you never get used to it. Can you tell it’s the holidays blues season? Ha. I just want him home so we can all decorate the tree together. It’s the little things. Okay, enough, I’m bumming my own self out. Oy. Okay on to this recipe. I cannot wait to try this one. I love easy overnight recipes. They are the key to a happy morning. Love the photos. The one of you pouring the syrup over had my stomach growling. I could not do what you do every week with all the extra curriculars. I’d go INSANE. This girl needs her relax time. With french toast! French toast is often a special occasion food in my family, getting this as Breakfast Treat for weekend, with no extra work!! yes please! thanks for sharing a good idea! We would definitely eat this for brinner! French toast is the hubby’s favorite so I’m sure he would swoon over this. We love having french toast casseroles ready for busy weekends! This one looks great! I am out of the house early on the weekends too. Sometimes we get to have a more made-up breakfast though, and I love to have sweet goodies like this casserole. omg, that syrup shot!! It has me just dying for a big, warm plate of this right now!!! Hi Aimee! 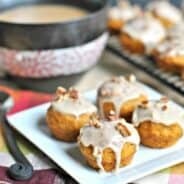 I just wanted to let you know that I’m featuring this amazing recipe in my post in order to make it for my families, this is ourcouponss.com, thank you for your sharing. So I made 2 yesterday. i made some changes due to family preferences and I changed the light brown sugar to white sugar for my dad do not like it, feather more, Apple pie spice in place of cinnamon. Yum yum!! Hi Aimee – I entertain two to four times a year and lean toward brunches. I love being able to prepare my food the day before. Therefore, I am always on the search for unique brunch casseroles. I made the Cinnamon French Toast Casserole yesterday for 25 friends and family. WOW, it was great. I asked our friends and family to critique the “new” casserole and every one of them loved it … it was a hit and it is a keeper!! Thank you. Made this this weekend. Delicious. 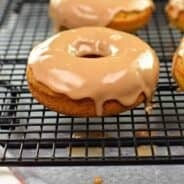 Reminded me of sticky buns. Easy. It is sweet, gooey goodness. My husband who isn’t one for many sweets had 2 helpings and again the next day. Have been looking for overnight breakfast recipes & this would be nice. Could this be doubled & made in a 9″x13″ aluminum foil pan & for how long? I would be fixing this for 10+ people. I also am from Ohio. You may have visited a county away?